This recipe appeared in an issue of the St. Petersburg Times. It looked intriguing and offered a change of pace. We liked the result well enough to add it to or list of recurring recipes. 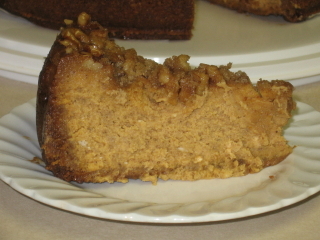 The original recipe featured a crust made with crushed vanilla wafers. 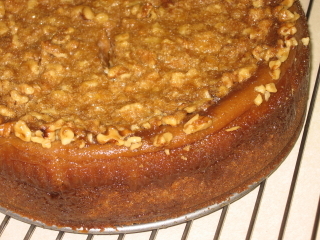 Since we always have the Graham cracker crumbs on hand, we substituted them in the crust with good results. 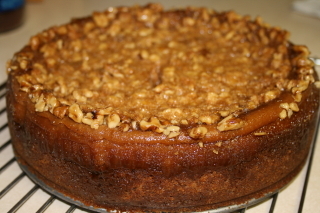 If you decide to make this cake, you may wish to use the original vanilla wafer recipe. The original recipe called for a 9-inch spring form pan but we have found a 10-inch pan avoids messy spills. Prepare your 10-inch springform pan. Use pan bottom to trace circle on parchment paper. Cut out circle leaving two inch-square tabs at the 3 and 6 o’clock positions (more on that later). Cut strips of parchment paper equal to the height of your pan and enough strips too around the inside of the pan. Spray the inside of the assembled pan lightly with non-stick vegetable oil spray. Wipe off excess. Place circle on the bottom of the pan and fold the little tabs up against the side of the pan. Line the inside of the pan with ths strips. A small spritz of the non-stick spray will help the overlapping strips stick together. Set aside. Use a mixer to cream the cheese until smooth. Slowly add the sugars while continually mixing. Mix until mixture is smooth. Add two of the eggs, one at a time waiting until each is incorporated, mix until well blended. Pour the mixture into a large mixing bowl. Mix the pumpkin, the remaining three eggs, cinnamon, cloves and nutmeg. Mix until well combined. Add to the cream cheese mixture and blend well. Pour the mixture into the prepared crust. Bake in a preheated 350 oven for one-hour. In a small mixing bowl, cream butter and brown sugar. Stir in walnuts. Gently spoon topping mixture over the hot cheesecake and return to the oven for an additional 15 minutes. Cool for an hour on a rack or until cake separates from the side of the pan. Remove the outer ring of the spring form pan, peel away the parchment strips and allow the cake to cool completely. Refrigerate over night.